Apple will be releasing the new version of OS X, next week. 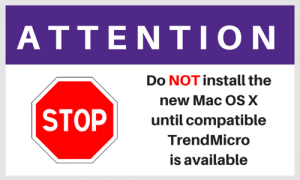 Information Technology Services (ITS) recommends not installing the new version of OS X until ITS announces a compatible version of TrendMicro antivirus. upgrading to the new version of OS X with TrendMicro antivirus installed results in the computer not functioning. installing TrendMicro antivirus on a computer that already has El Capitan installed results in the computer not booting correctly. Both of these instances will require a technician to resolve the issue. Typically a new version of TrendMicro that is compatible with new versions of OS X are made available by the manufacturer within a few days of the final release of the new version of OS X. If you have any questions, contact the IT Help Desk, helpdesk@k-state.edu, 785-532-7722.